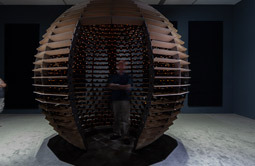 A 3m diameter sphere that supports 1,128 loudspeakers each of which plays a different composition by Johann Sebastian Bach. 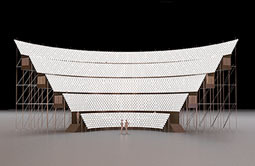 The piece is designed to concentrate Bach’s entire musical production in a dense multi-channel structure that visitors can enter. At any given point, all compositions play-back simultaneously creating a polyvocal and complex sound environment focused in the centre of the sphere; from time to time the speakers are gradually silenced in waves to highlight one speaker playing a single composition. 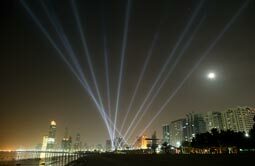 Pulse Corniche was an interactive canopy of powerful light beams projected into to the sky by robotic searchlights whose brightness and orientation was controlled by the heart-rate of visitors to the Abu Dhabi’s Corniche. 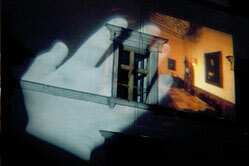 People were free to participate by holding a sensor placed in the centre of the plaza that converted the electrical activity of their heart into a unique lighting sequence. 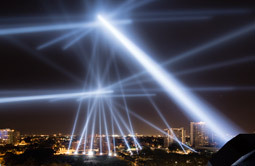 The intensity and direction of the lights visualized the different biometric rhythms of each participant, in an urban scale. View Details. "Pan-Anthem" is an interactive sound installation where the national anthem of every country in the World plays back on a movable speaker that is magnetically attached to a large wall. The speakers are precisely arranged to visualize national statistics: population, GDP, area, number of women in parliament, GINI, year of independence, HDI and so on. For example, when the work is configured to show military spending per capita, on the far left of the wall the public can hear the anthems of countries without military forces like Costa Rica, Iceland and Andorra while at the far right they can hear Saudi Arabia, Israel and the United States, which spend more than $2,000 per person per year. If no one is in the exhibition room all the speakers are silent, but as a visitor approaches a particular set of speakers these start playing automatically, creating a positional panoramic playback of anthems associated to similar statistics View Details. Vicious Circular Breathing is a hermetically-sealed apparatus that invites the public to breathe the air that was previously breathed by participants before them. The installation consists of a glass room with double sliding doors, two emergency exits, carbon dioxide and oxygen sensors, a set of motorized bellows, an electromagnetic valve system, and 61 brown paper bags hanging from respiration tubes. In the piece, visitors’ breath is kept circulating and made visible by automatically inflating and deflating the brown paper bags around 10,000 times a day, the normal respiratory frequency for an adult at rest. 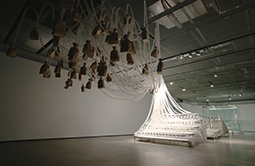 The piece includes warnings for asphyxiation, contagion and panic, and produces a faint mechanical sound, a quiet whir from the air flow and louder crackles from the crumpling bags. View Details. 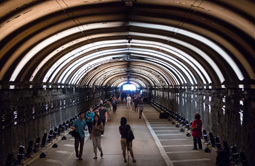 An installation designed to transform the Park Avenue Tunnel in New York City with 300 theatrical spotlights that produce glimmering arches of light along the tunnel’s walls and ceiling. 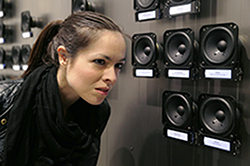 Participants control the intensity of each light by speaking into an intercom at the tunnel’s center which records their voice and loops it. Louder speech increases the lights’ brightness proportionally, creating a Morse-like code of flashes throughout the tunnel. 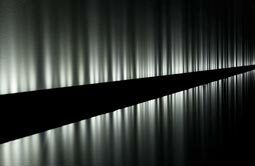 The individual voices can be heard as pedestrians walk through the tunnel, on 150 loudspeakers, one beside each light arch and synchronized with it. 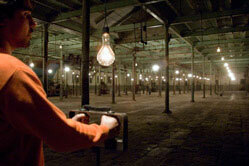 At any given time, the tunnel is illuminated by the voices of the past 75 participants: as new participants speak into the intercom, older recordings get pushed away by one position down the array of light fixtures until they leave the tunnel, so that the content of the piece is changing constantly. View Details. 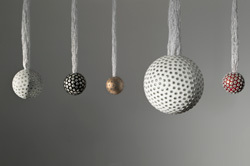 "Sphere Packing" is a series of 3D-printed pieces designed to concentrate the entire musical production of a composer in a single dense multi-channel device. The size of each sphere is directly proportional to how prolific the composer was, for example the sphere for Johann Sebastian Bach has 48 cm diameter and holds 1100 loudspeakers playing simultaneously Bach's 1100 different compositions, while the sphere for Hildegaard Von Bingen only has 11 cm diameter and 69 loudspeakers. The project presents at a glance the comparative production volume of many composers. As people are a couple metres away from a sphere they hear a quiet murmur of sounds, but as they approach and put their ear up close to individual speakers they can hone in on specific compositions. View Details. 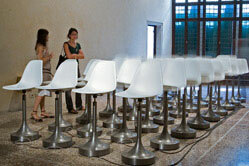 Last Breath is an installation designed to store and circulate the breath of a person forever. 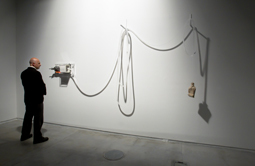 The piece consists of a small brown paper bag which inflates and deflates automatically thanks to motorized bellows similar to those found in artificial respirators in hospitals. 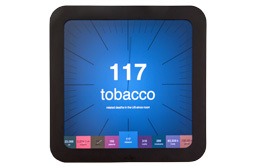 The apparatus hangs on a wall and is activated 10,000 times a day, the typical respiratory frequency for an adult at rest, including 158 sighs. View Details. As a participant speaks into an intercom, his or her voice is automatically translated into flashes of light and then the unique blinking pattern is stored as a loop in the first light of the array. Each new recording pushes all previous recordings one position down and gradually one can hear the cumulative sound of the 288 previous recordings. The voice that was pushed out of the array can then be heard by itself. View Details. 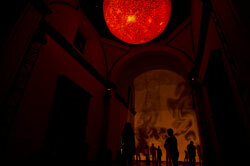 "Solar Equation" is a large-scale public art installation that consists of a faithful simulation of the Sun, 100 million times smaller than the real thing. 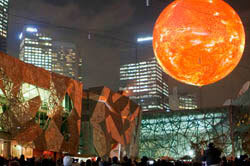 Commissioned by the Light in Winter Festival in Melbourne, the piece features the world’s largest spherical balloon, custom-manufactured for the project, which is tethered over Federation Square and animated using five projectors. The solar animation on the balloon is generated by live mathematical equations that simulate the turbulence, flares and sunspots that can be seen on the surface of the Sun. This produces a constantly changing display that never repeats itself, giving viewers a glimpse of the majestic phenomena that are observable at the solar surface and that only relatively recent advances in astronomy have discovered. Using an iPhone, iPod touch or iPad, people may disturb the animations in real-time and select different fluid dynamic visualizations. View Details. An installation-performance commissioned for the 50th Anniversary of the Guggenheim Museum, inspired by Kandinsky's opera, "The Yellow Sound" (1912). 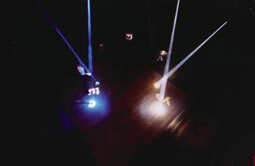 In "Levels of Nothingness", the human voice is analyzed by computers, automatically controlling a full rig of Rock-and-Roll concert lighting and creating an interactive colour show. 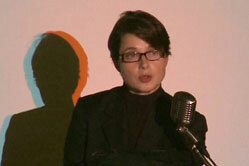 For the New York performances, Isabella Rossellini read a libretto co-written by Brian Massumi, which included seminal philosophical texts on skepticism, color and perception, including writings by Kandinsky, Deleuze, Sanches, Simon Baron-Cohen and Alexander Luria. Following the performances, audience members could test the color-generating microphone. View Details. 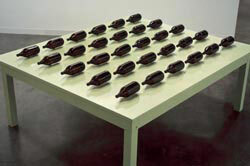 "Voz Alta" (Loud Voice) is a memorial commissioned for the 40th anniversary of the student massacre in Tlatelolco. 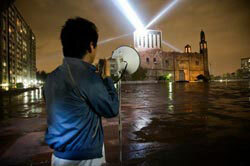 Participants who speak into a megaphone automatically control the brightness of four searchlights that relay their voice over Mexico City as quiet light flashes; tuning into 96.1FM radio allows people anywhere in the city to listen in live to what the lights are saying. View Details. 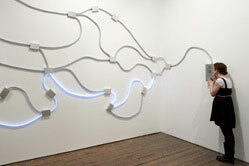 "Less than Three" is an interactive installation of light strips that form a network between two intercoms. 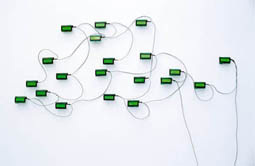 As a participant speaks into an intercom, their voice is translated into corresponding flashes of light and this light pattern is transmitted visually along one of the several possible pathways through the network. 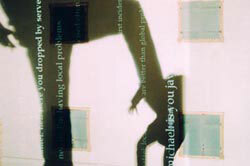 When it reaches the other side, the viewer's phrase is once again released as sound. Several voices can be carried simultaneously and the short contributions going fast through the network and the longer ones taking longer. View Details. 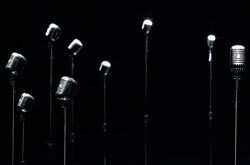 "Microphones" is an interactive installation featuring one or several 1939-vintage Shure microphones, placed on mic stands around the exhibition room at different heights. Each microphone has been modified so that inside its head is a tiny loudspeaker and a circuit board connected to a network of hidden control computers. When a public member speaks into a microphone, it records his or her voice and immediately plays back the voice of a previous participant, as an echo from the past. View Details. "Pulse Room" is an interactive installation featuring one to three hundred clear incandescent light bulbs, 300 W each and hung from a cable at a height of three metres. The bulbs are uniformly distributed over the exhibition room, filling it completely. 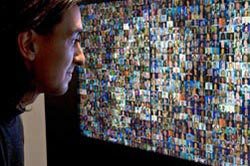 An interface placed on a side of the room has a sensor that detects the heart rate of participants. 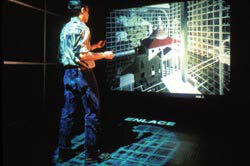 When someone holds the interface, a computer detects his or her pulse and immediately sets off the closest bulb to flash at the exact rhythm of his or her heart. View Details. "Synaptic Caguamas" is a kinetic sculpture consisting of a motorized Mexican "cantina" bar table with 30 "Caguama"-sized beer bottles (1-litre each). The bottles spin on the table with patterns generated by cellular automata algorithms that simulate the neuronal connections in the brain. Every few minutes the bottles are reset automatically and seeded with new initial conditions for the algorithm, so that the movement patterns are never repeated. View Details. "33 Questions Per Minute" consists of a computer program which uses grammatical rules to combine words from a dictionary and generate 4.7 trillion unique, fortuitous questions. The automated questions are presented at a rate of 33 per minute --the threshold of legibility-- on 21 tiny LCD screens encrusted on the support columns of the exhibition hall or mounted on a wall. The system will take over 271,000 years to ask all possible questions. A keyboard allows participants to log on to the building and add their own questions to the automatic flow. View Details.